Current Project - "This is NOT a Maze: Countries"
I chose items for each page of my book based on a letter or number. My next project centers around countries & each page will focus on one country. Items will include: national animals, coat of arms, landmarks, remarkable accomplishments of its citizens, etc. I began this in 2016 but had to put it on hold for 6 months while I met publishing deadlines for my alphabet project. I am 17 countries in on this project with a goal of 25 in total. I'm not under contract for this project, but rather doing it for fun for now, similar to my previous alphabet project. 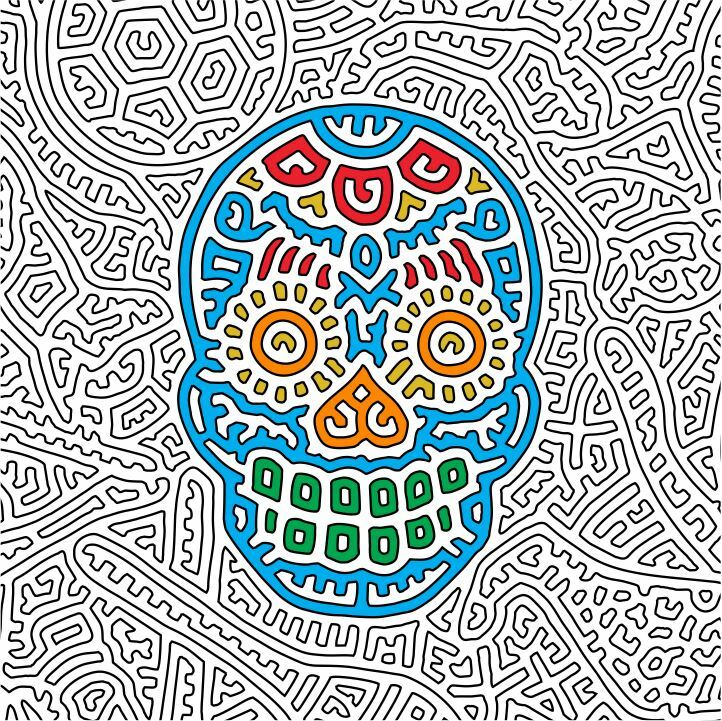 The adjacent Sugar Skull came from my 'Mexico' page to represent their national holiday 'Day of the Dead'. Each page in this upcoming book is loaded with 30-45 large hidden items as well as a collection of expert mode hidden items. Click on any page to enlarge & print out. How soon will I be done? This progress wheel is my way of staying accountable/keeping track of where I am in the process. For each country listed there are 2 slots: one slot for the hand drawn portion of the page, the other slot for the digitizing phase of the process. Depending on whether or not I add additional countries to my list, I should be able to finish next year. If there's a country missing from my wheel, or if there's an item for a page I haven't started yet that you think I need to include, feel free to shoot me a message using the contact form at the bottom of this page. I always appreciate a good feedback, especially when it's just me doing all the research, prep, & execution.